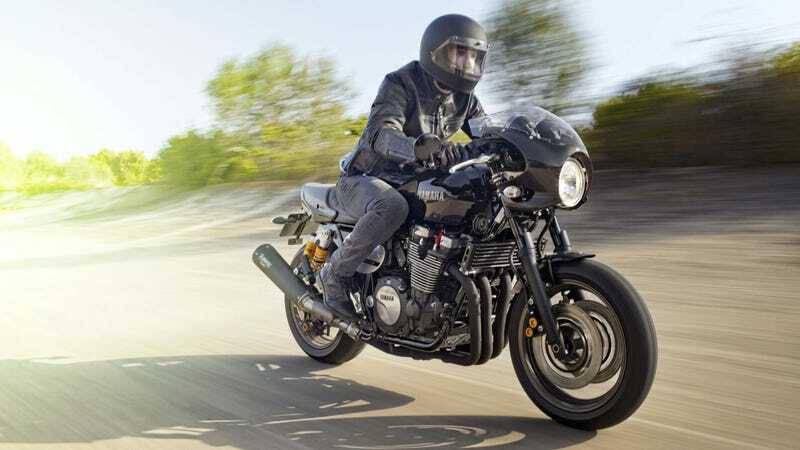 I'm in a love-hate relationship with the Yamaha XJR1300. I love it for its simplicity and tweakability, but I hate the fact that Yamaha keeps trotting out mildly refreshed versions because it's run out of ideas. Well, the pendulum has swung once again with the 2015 XJR1300 Racer. The engine is the same 1251cc DOHC air-cooled inline-four that's been around since When Doves Cry topped the charts. But that doesn't make it any less enticing, with 98 hp and 80 lb-ft of torque. Both the "new" XJR and the Racer version come equipped with Ohlins rear shocks and right-side-up forks, but the Racer hides that hideous set of plastic gauges with a retro-style carbon fiber front fairing with clip-ons protruding out the sides. Yamaha worked with customizers, including Wrenchmonkees and Deus Ex Machina, so there's a smattering of trick bits available from the factory, including that slick Akrapovic exhaust that connects up with the matte 4-2-1 piping and Rizoma accessories. Unfortunately, the XJR remains a Euro-only affair, so don't expect this 2015 on our shores anytime soon.